The boxer was developed in Germany during the 19th century. The breed was bred from powerful mastiff dogs to create a breed that would excel as a fighter and hunter. The Germans used the dogs to hunt large and fierce game such as wild boars. The name "boxer" refers to the breed's tendency to stand up on its hind legs and batting out its front paws. The breed was brought to America in the 20th century after World War I. The AKC recognized the breed in 1904 and it started rising in popularity by 1930. 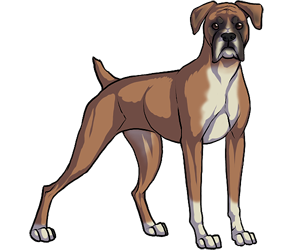 Today the Boxer is fiercely loyal and is known for their good behavior around kids. Boxers are born with floppy ears and long tails. Their ears were originally cropped and tails docked so that they wouldn't get in the way during fights and hunts. The boxer has been used in numerous wars as messenger dogs, guard dogs, and pack carriers. Boxers were first shown in 1895 in a dog show for St. Bernards.